It’s that time of year when I get some of my most beautiful blooms. My Tulips and Daffodils are done and the Cherries and Dogwood are spent. Now is the time for the Irises. We have one of the nicest Iris farms and display gardens around and soon I will visit. Just not on Mothers Day weekend. Instead I will admire the Irises I have in my own yard. I have some who are descended from tubers I got 20 years ago. And some which I have collected over the years are more recent. Just take a look at some of the ones I gave blooming now. I will get more and more each passing day. Enjoy. There are times like this viewing all your gorgeous irises that I regret removing most of mine. In an effort to cut down on perennials that need dividing and from an iris borer infestation one year, I have only a few left. Last year a friend gifted me a piece of her white iris ‘Immortality’ which will bloom spring and late summer so I figured it was worth having to add to my moon garden. Thanks for sharing your irises and linking to Mosaic Monday. Thanks for stopping. Yes, dividing irises can be a job. A couple of years ago my housemate dumped the giveaway divisions back into the replant pile. I have been trying to weed out the extras ever since. Lol. What gorgeous iris!! Thank you for linking up to Garden Tuesday! Thanks and thanks for stopping. So glad to join your party. I had a few Iris this year, but nothing to compared to yours, Simply beautiful. Thank you. I do so love irises. They put on such a show after all the tulips and daffodils are spent. brought sweet memories to me. My parents had an Iris bed when I was growing up. They are so pretty. Thanks and thanks for coming by. I appreciate your kind comment. Irises are some of my favorite flowers. All of them are nice but my favorite is the purple and white iris. Thanks and thanks for coming by. Irises are some of my favorite flowers so I love this time of year. What an interesting and beautiful blog! Lovely irises! Your garden staff looks really cute. We had a very much beloved cat that looked like Raja. Thank you for joining my blog; I became your new follower through GFC. Thank you and thanks for joining my blog. Raja thanks you too. Thanks so much for stopping by to see our baby morning Doves which have since flew the coop!! I will be doing another post about that soon…. Thanks and thanks for stopping. Your doves were really something special. I love iris, yours are beautiful. I only have a few, but here in Wyoming I have to wait a while longer for them to bloom. Thank you. And thanks fir stopping. Irises are some of my favorite flowers. Thanks and thanks for stopping by. I think you are right about the frilly blouses. They are just gorgeous! I especially love the deep purple and white one. Thanks and thanks for stopping. That purple and white is one of my favorites too. Gorgeous irises! They come in so many amazing colours. Thanks and thanks for coming by. 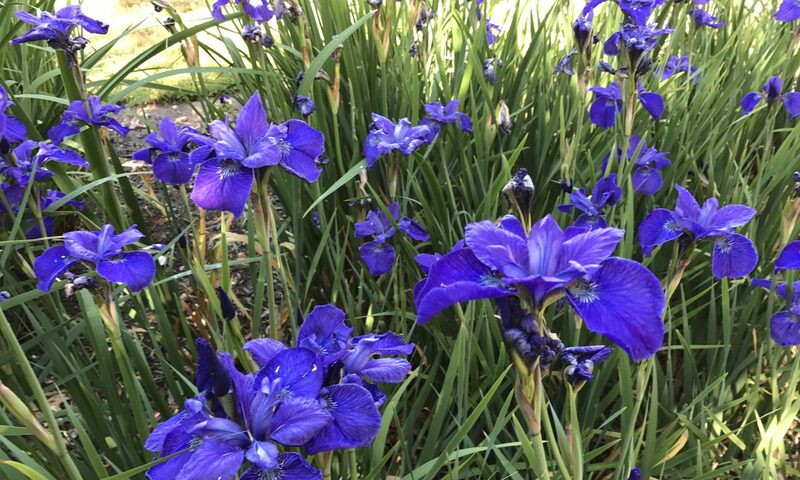 I love the array of colors you can have with irises. Yael, you have some real beauties! Love each and every one! It has been raining here for three days. On Sat. between rainstorms a friend and I did a bit of Iris swapping. Generally I don’t move them this time of year, but because of the rain they look like they had been there all along. I added two peach varieties and a lovely burgundy and white. I had a gorgeous white one and pale blue at my previous home. Our son bought it and I keep meaning to go get a start. Thanks for sharing your beauties with SYC. Thanks and thanks for stopping. Having all the irises blooming is one of my favorite things each year. I have to divide mine this year, and fortunately have a taker for all the divisions. Hi Yael, just stopping by to let you know that I will be featuring you at SYC this week. Thank you so much for featuring this post. I will look forward to seeing it. Your iris’s are stunning! I love them and they are one of my favorite flowers. I am afraid that mine did not do well this year do to our drought. A few had a some blooms but nothing like they normally do. I was so disappointed as I wait all year for them to bloom. I came over from Jann’s party and I love your blog since I am a gardener also, so I will be following you. So sorry to hear that your irises didn’t do well this year and about your drought. So many areas are being effected. Hopefully, the water conditions will I,prove for you in the coming year. Thanks and thanks for coming by. I’m so glad you enjoyed the irises. I know I certainly do. Irises are such magnificent flowers and the colours and forms nowadays are just mind-boggling. Lovely photos. Many thanks for linking up with Floral Friday Fotos, I look forward to your next contribution! Thanks and thanks for coming by. I love irises and am always amazed at the variety of colors that they have.